Leeds is a hipper city than you might think. Home of the first European music college to offer a jazz degree, it has attracted talented students from around the continent, many of whom have stayed in town. As a result, it has a fairly happening music scene that can more or less support a band like the New Mastersounds. 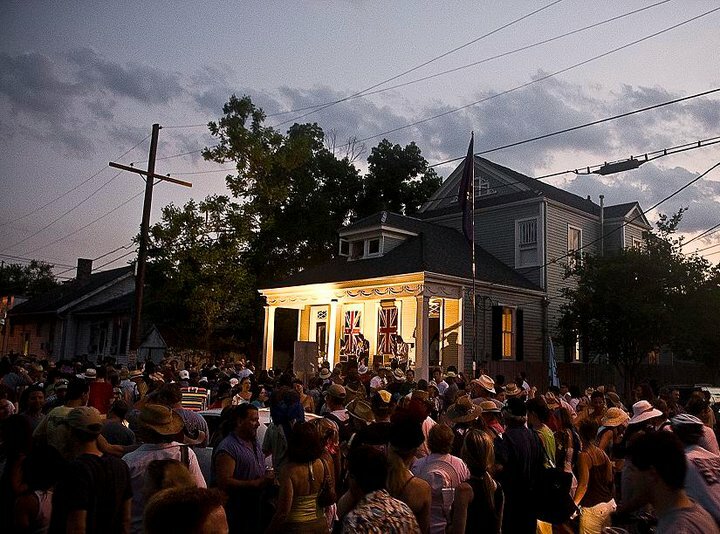 Still, it’s not New Orleans, so naturally the band jumped at the chance to play Jazz Fest, post-Katrina. Appreciating the band’s journey to the birthplace of all funky sounds, filmmakers Marca Hagenstad and Aaron Dunsay documented their mini-tour in Coals to New Castle—The New Mastersounds: from Leeds to New Orleans (trailer here), which screened last night at the 2010 Royal Flush Festival, New York’s annual celebration of film, music, and attitude, newly relocated to the Brooklyn Knitting Factory for extra added swagger. The New Mastsersounds might have scratched out an even larger following in the States than in their native Britain. In fact, their 2007 New Orleans gigs generated a lot of heat and American goodwill for the band. A jazz-influenced instrumental funk jam-band, the NM’s blur genre distinctions in way that makes them feel quite at home in the Crescent City club circuit. Wisely, Hagenstad and Dunsay focus on their three big gigs: the venerable House of Blues, a free outdoor porch concert (literally on their host’s porch and probably their biggest show in NOLA), and at the Blue Nile on Frenchmen Street. (I’d just like to take a moment to give a shout out to the Blue Nile, whose staff was quite welcoming when I caught Kirk Joseph there nearly three years ago). Sweet Georgia Brown, the music of Coals is funky. The NM’s are a groovy band and they had some killer NOLA musician’s musicians sitting-in with them in 2007, including the likes of Stanton Moore (of Galactic) and Ivan Neville (founder of Dumptaphunk). Though the music drives Coals, the bandmembers, particularly drummer Simon Allen, offer some interesting insights on the sociological differences between the British and American scenes. Indeed, the very NOLA tradition of sitting-in was something that took some getting used to for the NM’s. They clearly warmed to it though. Obviously, Katrin a’s wake was an all too fresh reality when they played Jazz Fest, but Hagenstad and Dunsay smartly resist over-playing that card. Instead, they just let the band and their guests chug away. The results are just a rollicking good time. With their retro-1970’s graphics and some energizing concert footage, Coals looks cool and sounds great. Frankly, it is more than entertaining enough to merit a legitimate theatrical life. Unfortunately many distributors probably will not understand the New Mastersounds’s knack for packing houses. Thoroughly satisfying, Coals next screens on October 24th at the Hot Springs Documentary Film Festival in Arkansas, while the 2010 Royal Flush Festival continues at its new BKLN home through the 18th.